← Are your customers bored with your store? Is Your Store Ready for the New Credit Cards? Sometimes called “Chip Cards,” “Smart Cards” or “EMV Cards” – these cards are already being rolled out by financial institutions. In this blog, we are going to “dip” into some Q & A about the new chip cards, the chip-enabled terminal and the October 1st Liability Shift Deadline. 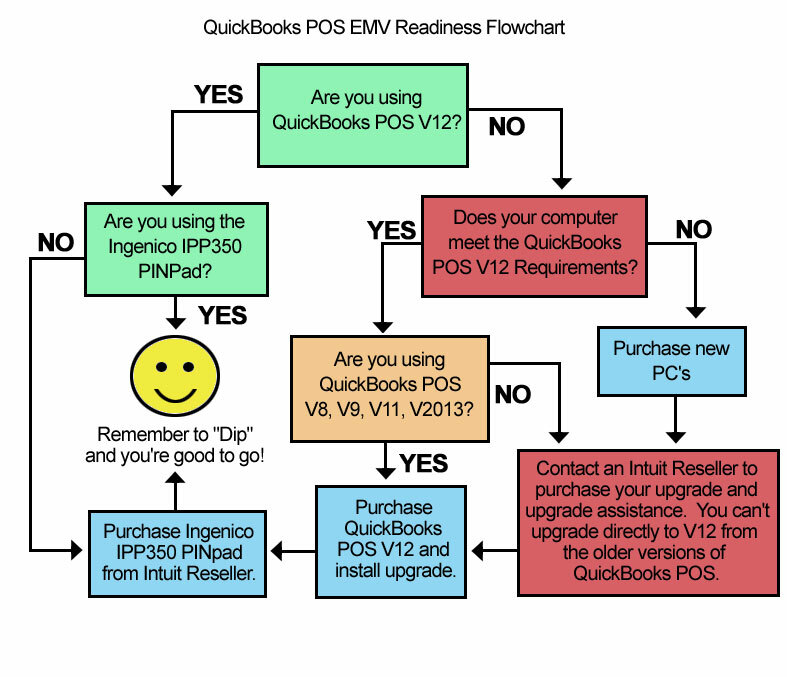 And since QuickBooks Point of Sale is the most popular POS system used by independent retailers, we provide a flowchart for implementing EMV as it relates to QuickBooks Point of Sale. Enjoy! A chip card is a standard-size plastic debit or credit card that contains an embedded microchip. Unlike magnetic-stripe cards, every time an EMV card is used with a chip-enabled terminal for payment, the card chip creates a unique and encrypted transaction code that cannot be used again. Please note that chip cards will also contain the traditional magnetic stripe so that it can be used by merchants that have not converted to EMV – it will be your responsibility to get customers with chip cards to “dip” rather than “swipe.” – more on that later. Instead of “swiping” a credit card and having a machine read its magnetic stripe, cardholders or cashiers will insert or “dip” the card into a machine that directly contacts the chip and reads it. But unlike a simple magnetic strip where the information is read-only by the terminal, the chip card interacts with the machine that is reading it, generating a unique one-time code that is needed for the transaction to be approved – a feature that is virtually impossible to replicate in a counterfeit card. What is the October 1, 2015 deadline? The customer card is swiped rather than dipped on a transaction even if you have a chip-enabled terminal. If the customer does not have a chip card, but you have an EMV terminal, then the customer’s credit card company is liable. It’s interesting to note that if you don’t have an EMV terminal and the customer does not have a chip card, liability remains with the card issuer. You should also contact your merchant services provider for more information. And while you have them on the phone, ask for a rate analysis to see if they can give you better rates. What do QuickBooks POS user need to do to get ready? First of all, if you aren’t using Intuit Merchant Services – meaning you are using a stand-alone terminal, then you will need to contact your merchant services provider for assistance. This section only relates to QuickBooks POS users who are also using the integrated credit card solution provided by Intuit Merchant Services. If you’d like to begin using the integrated Intuit Merchant Services solution, give us a call to get started. If you are using QuickBooks POS V12 (released in 2015) with the Ingenico IPP350, you are good to go. Just remember to have customers dip rather than swipe. If you are using QuickBooks POS V12 but are using the standard card swipe that ships with the Intuit Hardware Bundle, then you will need to purchase the Ingenico IPP350 from an Authorized Intuit Reseller like AZ Retail (800-777-1214) or directly through Intuit. If you are using an older version of QuickBooks POS, you will need to upgrade to Version 12 and purchase an Ingenico IPP350 from an Authorized Intuit Reseller like AZ Retail (800-777-1214) or Intuit directly to be EMV-compliant. But if you haven’t stayed current on your software or computers, there are several things to consider when upgrading. The age of your computer: If you are using anything less than Windows 7, you will need to upgrade your computers as well as your QuickBooks POS V12 software. QuickBooks POS V12 requires Microsoft Windows 7 (SP2 or later recommended), Windows 8, Windows Server 2008 (SP1 or later strongly recommended) or Windows Server 2012. Intuit recommends a Multi-core processor and 4 GB of RAM for a server install, but you should get as much RAM as you can afford – we always recommend at least 6 GB. The version of QuickBooks POS that you are using: If you are using a version that is older than version 9, you cannot directly upgrade older versions to V12. It must be done in steps. A qualified Intuit Reseller can help you with that. AZ Retail can assist you with finding someone in your area to help. This entry was posted in Business & Finance, QuickBooks POS, Uncategorized, Your Store and tagged Independent Retailer, QuickBooks POS, Retail, Small business. Bookmark the permalink.